Summer is nearly synonymous with “road trip”. Aside from your ultimate road trip playlist, the only other things you really need are friends or family, and your dog nicely fits into both of these categories. For both of you it will be about new shared experiences and companionship on the open highway, but we all know that hours in the car can often lead to discomfort as well. Here’s how to plan ahead to ensure that your canine pal has everything that they need for a great time on the road. As a rule, everyone should eat their own food between humans and pets, even on vacation fast food is not a treat - also, beware of pushing a full meal on your dog but instead stick to light snacks to reduce the chances of car sickness while on the road. 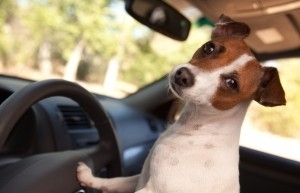 If you have a great road trip planned for this summer and are bringing your dog along, get in touch with your veterinarian today for your pet’s health information and more suggestions for a fun trip for everyone.